It’s kind of ridiculous how long it took me to carve these rings. 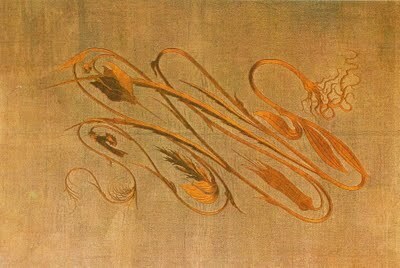 I based the art nouveau ring design on a photograph of an embroidery by Swiss designer Hermann Obrist (1890s). The image was in an art nouveau book I saw once and I just fell in love with it. I finally got molds made of these two rings. Even so, there is still a lot that needs to be done to prepare the waxes for casting (not even counting sizing…) in that they are just very complicated designs. Both are really awesome though; a couple of my favorites. 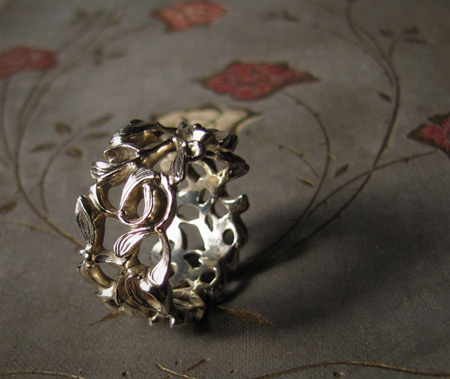 Both the Mistletoe ring and the Art Nouveau ring have been listed in my etsy shop. This entry was posted on Friday, May 21st, 2010 at 8:01 am	and is filed under Rings. You can follow any responses to this entry through the RSS 2.0 feed. You can leave a response, or trackback from your own site. I love this art and the rings are to die for. 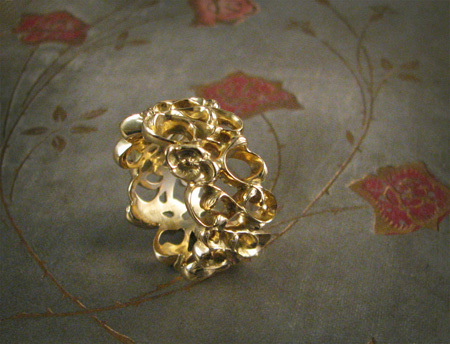 I would love to have “18K gold art nouveau ring” as a wedding-band, when I’ll get married. It’s just so gorgeous and stunning in every way, it’s impossible to dislike it. I love your art nouveau ring. Would you consider making one for me using the gold from my wedding rings (14k)? I am also interested in the art nouveau and mistletoe 18-carat band. Would it be possible to get a quote on this design as well?